There is never snow at Christmas on the African plain. It is always hot and the riverbed is nothing but dust. Families sleep on floor mats waiting for Father Christmas, dreaming of relief from the heat. They have come to cherish the simple gifts he always brings. In this adaptation of the Clement C. Moore poem, the Shangaan tribe receives something much more precious than material goods. With a glossary and combination of African languages, this story shares how the true message of the season comes to every country and brings hope to all people. The first printing of the book was released in 2004 to a wildly receptive audience. The story was adapted into a musical and is used by many schools for Christmas concerts. The South African edition of O, The Oprah Magazine selected the book as one of its “Favorite Things” for Christmas in 2005. Carroll Foster manages a small music company that promotes South African songwriters. 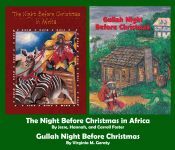 At home one night around Christmas time, her children, Jesse and Hannah, asked why there wasn’t a tale combining African culture with the holiday season. Having no answer, they decided to write their own Christmas story. 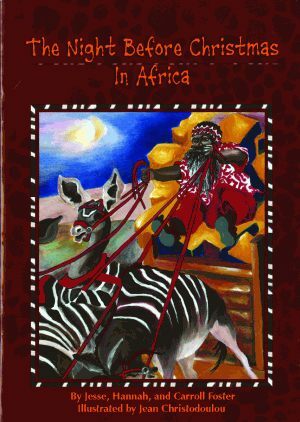 Not only is this tale innovatively African, every book sold supports a child at Sparrow Schools, which strives to assist disadvantaged, learning-disabled children and youth to realize their full potential. Born and raised in Texas, Foster moved to South Africa in 1982. She lives in a suburb of Johannesburg. Jean Christodoulou is a well-known South African artist whose simple but beautifully rendered illustrations reflect the native style common in her country.